HORSES gently graze, butterflies flutter and flowers blossom among centuries-old trees. 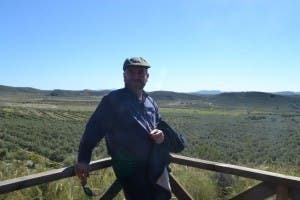 Tabernas’s Oro del Desierto olive grove is a different world to the vast super-intensive farms it neighbours, which are sapping the region of its life blood – water. Tended by his family for seven generations, owner Rafael Alonso Aguilera’s award-winning grove has been heralded by experts for its sustainable cultivation methods. “We use 1,500 cubic metres (m3) of water per hectare each year,” says 64-year-old Alonso whose trees cover 126 hectares. This is compared with the 5,000-to-6,000 m3 used in super-intensive groves. The importance of water saving is crucial to the future survival of Oro del Desierto, which is reliant on a small aquifer of the grove’s own. “We don’t try to plant as many trees as we can on our land, they are spread out around five and seven metres apart,” Alonso continues. “Our irrigation pipes are planted 40cm deep to stop the water from evaporating. “This system alone helps us to save 40% of water compared to the pipes that are laid on the ground, which are exposed to the intense heat we experience in this area. Water use is vigorously regulated through a computerised sensor system. “We only take 30% of what’s available in the aquifer to enable it to recharge and remain healthy,” explains Alonso. “We irrigate maybe once a week to 10 days, depending on climatic conditions like temperature or wind and the sensors that measure the humidity of the ground”. “We’ve been using this method for 20 years and it’s not failed us yet”. The 176 prizes Oro del Desierto (Gold of the Desert) has won is testament to the quality of the olives produced using sustainable methods. But although Alonso’s approach is known about across Spain, encouraging the much larger producers to his methods is a huge challenge due to their focus on maximising profits. 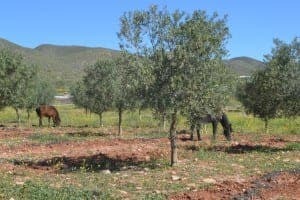 Alonso’s grove is substantially smaller than those of its giant olive-producing neighbours with a respectful 204 trees per hectare in comparison to their greedy 1,800 per hectare, meaning fewer olives per harvest. But despite increasing client demand, Alonso is unwilling to expand his grove at the expense of its precious water resource. He wants to preserve it for his own children and grandchildren. We would like to buy Tabernas’s Oro del Desierto olive oil in Asturias? Is it available there?